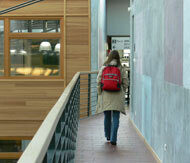 Viadrina European University has a guest house available to our guest academics. The integration house Fforst offers living space for more than 25 students from across the world. Students here live in an intercultural apartment community that spans four floors. The Studentenwerk Frankfurt (Oder) offers dormitories with single bedroom to five bedroom apartments in a total of five residence halls. Detailed descriptions of the rooms (prices, room sizes, furnishings, etc...) and of the individual halls can be found on the "Housing (Wohnen)" pages of the Studentenwerk along with the required applications. A Polish residence hall is the correct choice for students who desire to try out Viadrina's German-Polish vision! By living in a Polish residence hall, you will not only get to know Poland and its people, but you'll also get to know your fellow Polish students better. The residence halls are not at all far from Viadrina European University, and they may be of interest for German students because of their affordable cost.